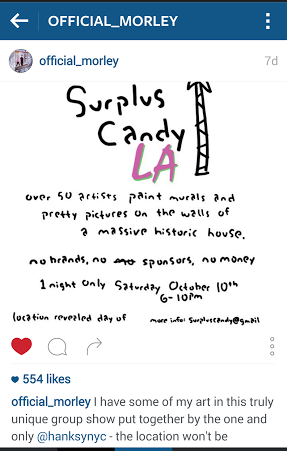 At 4:00 pm on Saturday, October 10th @hanksynyc announced on Instagram the location of the mansion where Surplus Candy, a pop up street art show, would be open for a “walk through” from 6 – 10 pm that very same night. On Sunday, October 11th, everything would be gone. Buffed. 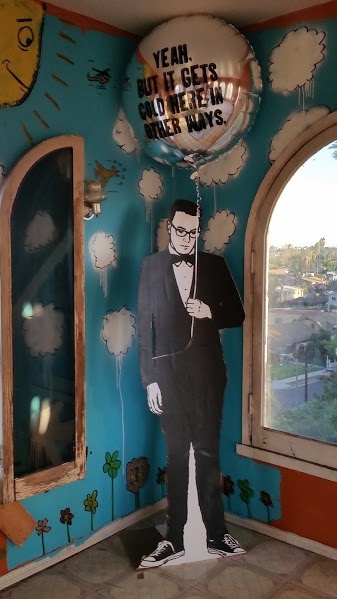 Hanksy, the street artist whose pseudonym merges “Banksy” with Tom “Hanks” was in L.A. from New York City. 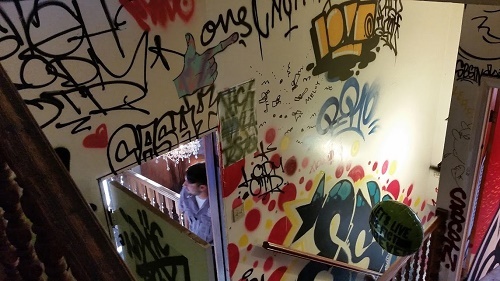 He organized the event and brought together over 50 of his street artist friends from all over to paint up the guts of a mansion. Street style. Like they do. 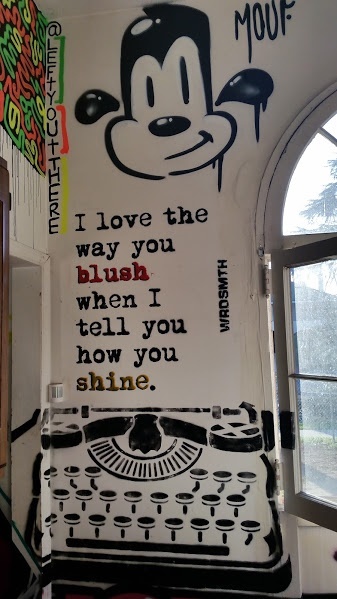 I started my part-time obsession with street art after I discovered prints of Banksy’s works all over London on a visit more than a few years back. 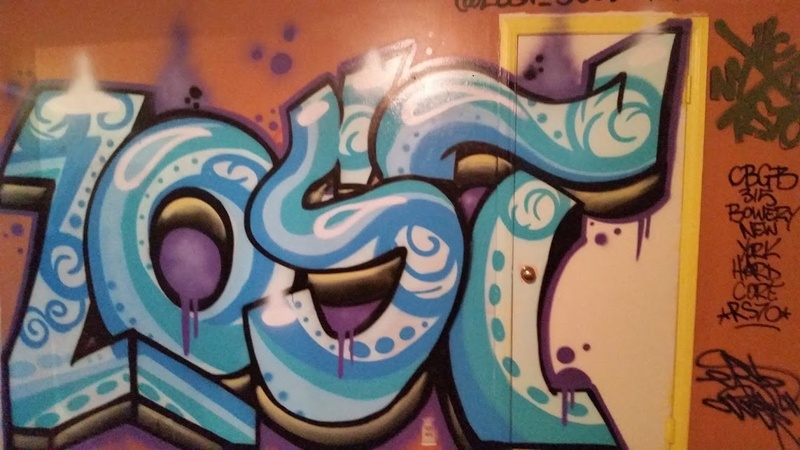 In the past, being an admirer of most graffiti, I had never been able to put a single name to it. Now I had one. Banksy. Since then I’ve added a few more. 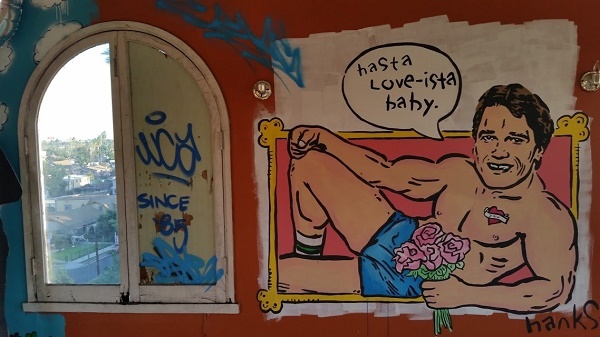 I began to appreciate the impermanence of street art. Temporary. You can’t buy it. You can’t sell it. You can’t visit it after a while because one day soon it will be gone – buffed. All you can do is snap a pic and share it with your buddies or show it to your grandkids one day. That is, if you hustle on over there in time. And if you ever have grandkids. 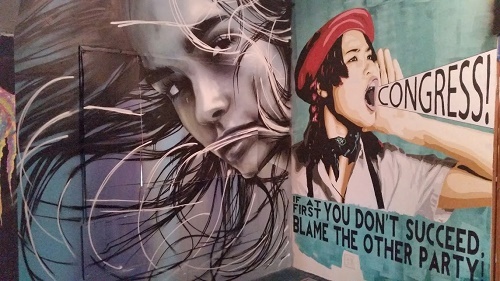 Pay attention and you can’t help but stumble upon this art form anywhere in Los Angeles. As I was satisfying my walk-a-holic needs last week, I came upon this on Melrose. @whisbe left his “Guns don’t Kill People, Selfies Do” behind while he was in L.A. Quite clever, I thought. I have my own interpretation. Do you? 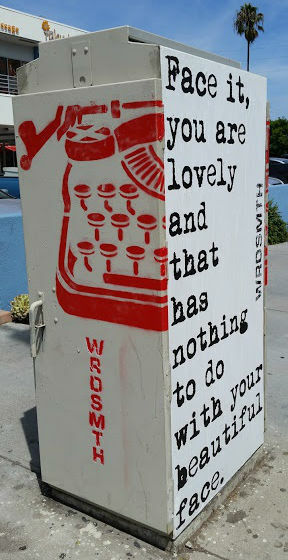 One of my favorites is @WRDSMTH and a few months ago I stumbled upon these sweet words posted in Marina del Rey. So. I’m looking forward to Surplus Candy. That Tuesday before the 10th I open my Instagram. 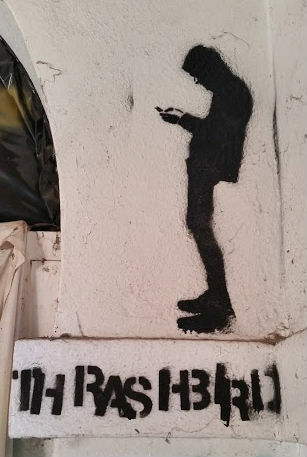 A street artist I follow, @official_Morley, posts a message from Hanksy. I’m surprised that I don’t follow @hanksynyc. So I tap “follow.” My interest piques. 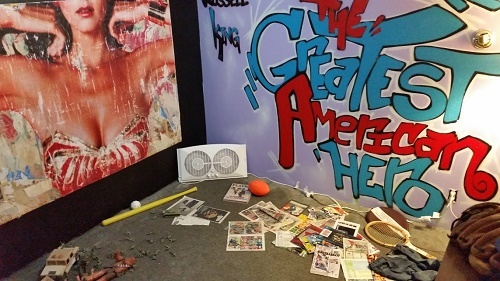 Each day that week @hanksynyc teases his followers by posting photos of what the artists are up to in that mansion. He tells his followers that the location will be disclosed no sooner than 4:00 pm Saturday, the day of the event. “no brands. no sponsors. no money,” he boasts. It’s free. After a one hour drive to travel 12 miles, I finally arrive in the West Adams neighborhood – not a neighborhood I have ever longed to visit. However, I find the neighborhood charming and fascinating. Old mansions and contemporary apartment buildings share the neighborhood, still flourishing with trees, brush and bougainvillea despite the water shortage and being backed up against the Santa Monica Freeway. I’m there by 5:20. Early. Regardless, the mansion is open and people are beginning to walk through. I walk down the driveway, though a corridor of wisteria, and up the stairs to the back door of the mansion. Artists are hanging out on the porch, and the security guard manning the door looks like he doesn’t quite know what to do yet. 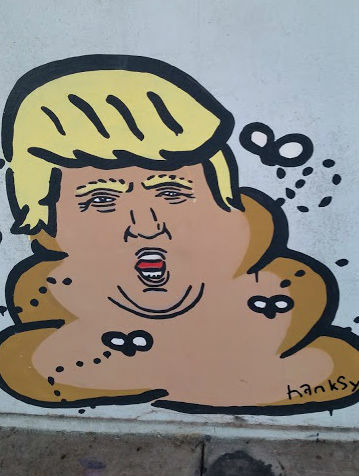 He stands right outside, between the back door and Hanksy’s Donald Dump painted close to the bottom of the exterior wall. I wonder how he feels standing next to that? It’s not difficult to get in – there are only a handful of people inside; although, the word on the street later was that after dark, lines grew longer, people dripped buckets. It is close to 100 degrees outside. I hit it at just the right time. The walls are covered. Where do i go first? I want to take it in all at once, but my eyes are confused and it takes more than a few moments before my brain sorts out all what my eyes have yet to discover. Here are a few photos of the works I see. A lot of stairs to climb. 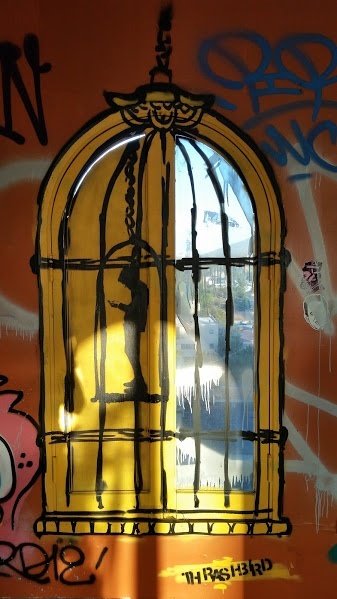 On the top floor, I find Thrashbird in his cage. 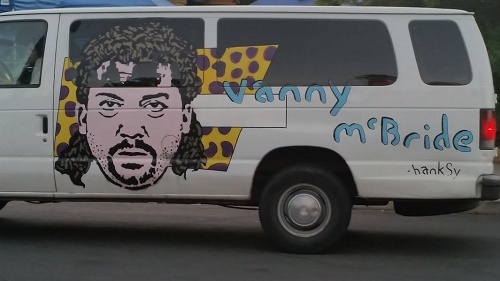 Then just as I exit the mansion, Hanksy’s “Vanny McBride” (spoof of Danny McBride) van passes by. The very next day I post this. 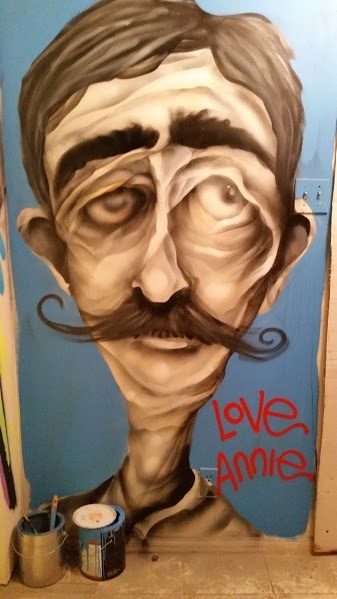 and my Los Angeles street art experience has been more than satisfied. For now. 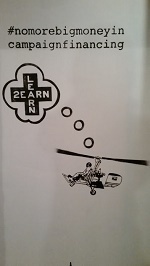 For more pics of the art visit Hanksy @hanksynyc and Birdman @birdmanphotos on Instagram. 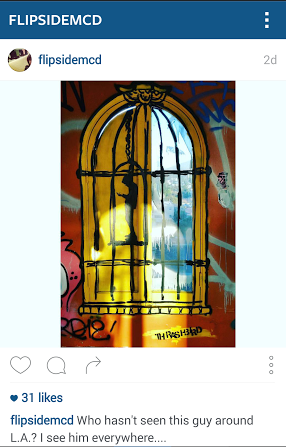 Also find awesome shots of the art posted by art photographer, Julio @jozayez on Instagram. If you’re looking for eye candy, follow him. You will not be disappointed. 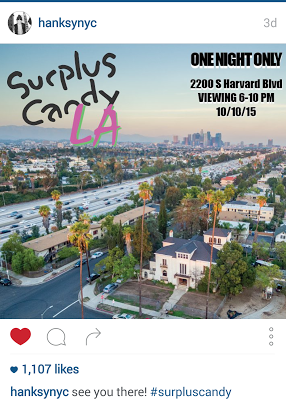 You can also search #surpluscandy or #surpluscandyla on Instagram. 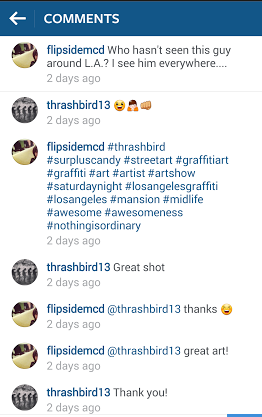 Below are a few of the artists’ instagrams if you’re interested in scoping out more of their works. Not all artists involved in the event are represented below. 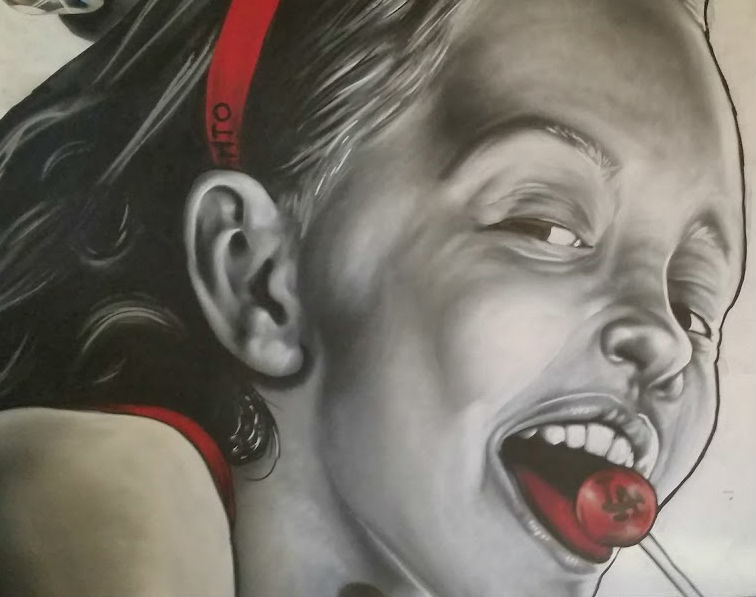 I think the thrill of it also comes into play (the thrill appeals to me)…many of the artists have signature pieces too…and many of these artists are those who often will get commissioned to do murals…which mean they stay. It’s more about the need for the artist to express, rather than satisfy an audience. My guess, anyway… I may be wrong. I’d totally do it…but I can’t paint…and I can’t run.